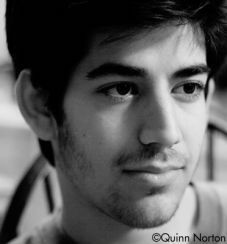 Aaron Swartz was a computer programming prodigy and activist who played an instrumental role in the campaign for a free and open Internet and used technology to fight social, corporate and political injustices. In 2000, at the age of 14, he co-authored RSS version 1.0, and shortly thereafter joined a working group at the World Wide Web Consortium to help develop common data formats used on the World Wide Web. Swartz was one of the early architects of Creative Commons and a developer of the Internet Archives’ Open Library, a free book database and digital library open to the public. He founded software company Infogami, and when it merged with online news site Reddit, he became a co-owner. There, Swartz released as free software the web framework he developed, web.py. In 2008, he founded Watchdog.net, to create greater political transparency and help citizens organize at a grassroots level. In 2010, he founded the online group Demand Progress, which launched a successful campaign against two Internet censorship bills (SOPA/PIPA), and in 2010-11, he studied the influence of big money on institutions, politics and public opinions at Harvard University’s Edmond J. Safra Center for Ethics. Swartz played a significant role in making government and academic data more available for free to the public. In 2011, Swartz was accused of using an MIT computer system to download numerous academic articles from the online archive JSTOR. JSTOR decided not to pursue charges, and asked the government not to prosecute, but Swartz was indicted by federal prosecutors for 13 felony charges. Prosecutors refused all settlement offers that did not include jail time, and required Swartz to plead guilty to felony charges. The case was pending when Swartz died at age 26 in January 2013. Concerns that the charges were excessive have led to a Congressional investigation of the way prosecutors handled the case. Since then, Swartz’s case has inspired proposed amendments to the Computer Fraud and Abuse Act that would remove the “dangerously broad criminalization of online activity,” according to the American Civil Liberties Union.